A few weeks ago, I posted my 31 top apps and resources that I use for my small business. And today, I want to dive deeper into one of those resources - the awesome Canva. This isn’t an affiliate post, I just think it’s a great program for small businesses. If you don’t already know, Canva is a free online design program. I use it on a weekly basis for my blog post graphics, and to create infographics, Facebook posts, social media headers, invitations, posters and more as needed. Here’s 17 reasons why I love Canva. And why, if you have a small business, you really should check it out. You’ll probably love it too. Yep, free. I’ve used the free one for years and it’s perfect for my needs as a one woman show. But if you use a lot of imagery in your business, for example, as a virtual assistant creating different graphics for multiple clients, consider investing in Canva Work. It’s only $10/month. Canva’s simplicity is what makes it so great to work with. It has a basic yet engaging interface with easy drag and drop options. Colours, fonts, typesetting and download buttons are arranged at the top. The side has the layout and graphic options. It covers just what the amateur graphic artist needs to get the job done, and none of the confusing extras. Canva has thousands of pre-designed templates for almost any media size you would ever need - social media posts, websites, blog, digital and print marketing and personal stuff. And they are all sized according to the platform’s specifications so you don’t have to worry about that. Choose one and style it to your liking with backgrounds, elements and text. You really need zero design skills with Canva because so much has been taken care of. You can edit and style your pre-designed template with over 30,000 “elements” - graphics, icons, shapes, lines, illustrations, photos and more. Most of them are free, some are $1 per design. Yep, Canva is built for the non-techies. Anyone can use this online program to make anything they choose, from a poster for the school bake sale to a professional business card. That’s because the templates are completely professional, the sizing is taken care of, and you can download your design for print or online, as you need it. Easy. 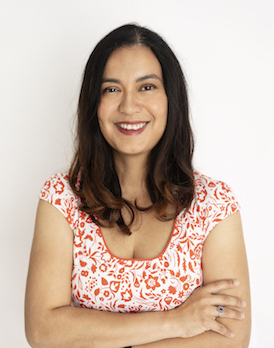 If you're loving this post as much as Canva, join my weekly newsletter! Loads more strategies and tips to boost your online business! If you love different elements of several layouts (which happens a lot because there’s so many awesome ones), you can cherry pick between them. You've not limited to a single layout. Just add more pages for the different layouts and copy and paste the bits you like. But this will never happen with Canva because it saves your work for you every few seconds, without you doing a thing. So you’ll never lose it. Awesome. As well, Canva saves your branding colours (up to 3 with the free version) so they’re always on hand for your work designs. With Canva Work (paid version) you can also save your logo and fonts. When you login in, you go straight to your homepage which shows all your designs in one spot. Pick the one you want to work on and get straight onto it. Replicate existing designs like a template. I do this every week for my blog posts and produce a graphic in less than a minute. This is really important of course for business branding. You can easily upload your jpg and png files to include your own logo, photos and other graphics. With Canva Work, you can also upload your own fonts if you want too, though Canva has a lots of fonts in its database too. You can also easily resize the same design in Canva Work. This is great if you do a lot of social sharing for example. You can quickly resize a featured blog post graphic for Facebook, Twitter, Pinterest and Instagram, without redoing any of the grunt work. You can download your design in 4 different formats, depending on where you’re using it - online or print, and the resolution you need. I download all of my website graphics as PNGs as they’re the smallest file size but for a printed poster, I’d choose a print ready PDF. We’ve talked about how easy and simple Canva is for non technical people. 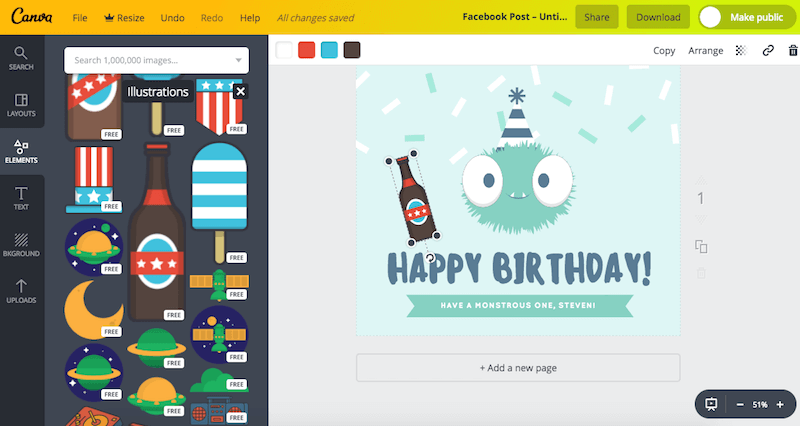 But if you’ve got a few design skills or are feeling creative, Canva is really fun! 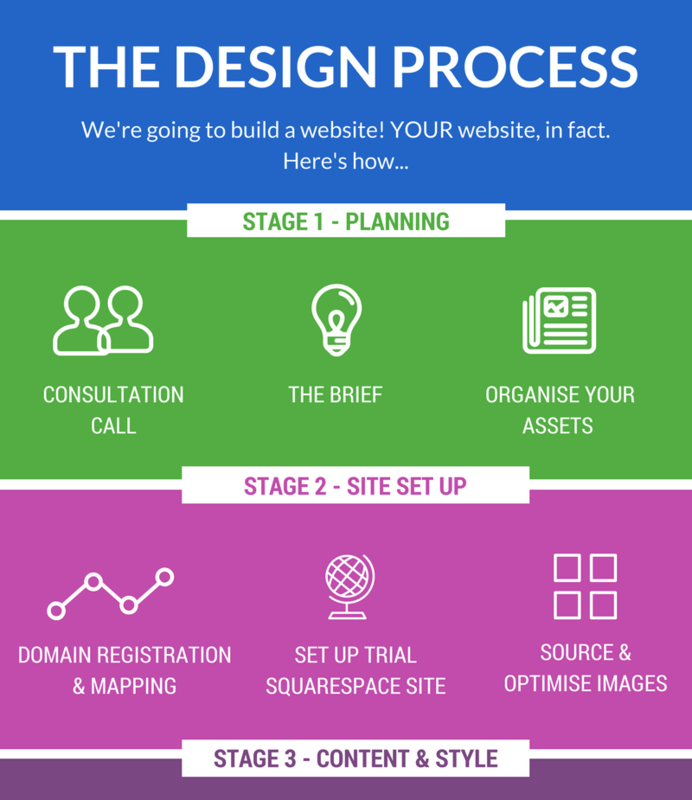 I was playing around with infographics recently and made this to show my web design process. Looks good, eh? If you’ve got a few people working with you in your business, you can create a free team of up to 10 people. This is great for sharing designs, branding and ideas. I did this with my virtual assistant; she’d create designs and I’d pop on, edit them if needed and download. So easy. If your business is on a visual social media platform like Instagram or Pinterest, then you can use Canva is to create great, shareable graphics. Boom! You can find lots of support and help with Canva’s free graphic design tutorials. It’s not training because Canva’s really too simple to need it but if you’d like to learn DIY design and branding, then this is a great way. If you’ve got any questions or headaches, Canva’s support team is just a message away. Forget searching endlessly through the net. Or, love Twitter? Shoot them a tweet and they’ll respond pretty fast. Now that’s service in the digital age. Have I convinced you? Moreover, can you believe that a program of this calibre is free? So get on board and find out what you’ve been missing.